The 9th International Conference on Community-Based Adaptation (CBA9) took place in Nairobi, Kenya, from April 24-30 2015. The CBA series of conferences focus on the latest developments in community-based adaptation to climate change. The theme of this year's event was "Measuring and enhancing effective adaptation", and all the posters presented at the conference were summaries of projects related to the conference theme. This poster is one of the posters featured at the conferance. For more information about CBA9, visit: www.cba9.org. If you want to learn more about community based adaptation, please visit the GICBA platform on weADAPT. 6. Male farmers due to climatic hazards. Data collection and Theoretical framework. The case study consisted of qualitative and quantitative methods. The sample size was 140 households with men and women farmers in Central Highland and Gash-Barka region of Eritrea. The field research took place in 2012. Data was analyzed using a theoretical framework vulnerability assessment draws attention to specific factors that influence exposure and adaptive capacities, in order to explain how and why some groups and individuals experience negative outcome from shocks and stressors. The most vulnerable are the least resilient. - Food scarcity lasts for 6 months, which is a long stretch for farmers with low adaptive capacity, especially it has severe effects on female-headed farm households. - Rainfall variability is a major problem with delays in rain leading to crop failures and droughts. As a result grains price is at its highest scarcity level. - Gender issues in agricultural institutions and culture-specific gender norms and roles result in discrimination of rights and access to resources. - Management of assets and resources by farm women is very important for households. As such, men expect women to be good managers and to make few resources last for as long as possible. This places greater stress on farm women, especially during droughts. As a result women eat less. - Community solidarity is highly valued as one of the major survival coping mechanisms within Eritrean culture. Borrowing money or grains from families, friends and neighbours during food shortages or droughts is commonly practiced. - Remittances are major contributors to families and to the country GDP in general. - To increase agricultural inputs resources and food availability for purchasing and access to international market. - Gender mainstreaming in Ministry of Agriculture other sectors. - Off-farm employment is essential to cope with shortage of food. - The policy of indefinite national service needs to be reexamine to address the shortage of male labour. - Current credit loans interest to be adjusted from12% to 5%. - The Ministry of Agriculture can develop indicators to measure the short-term and long-term outcomes of services provided to these groups. 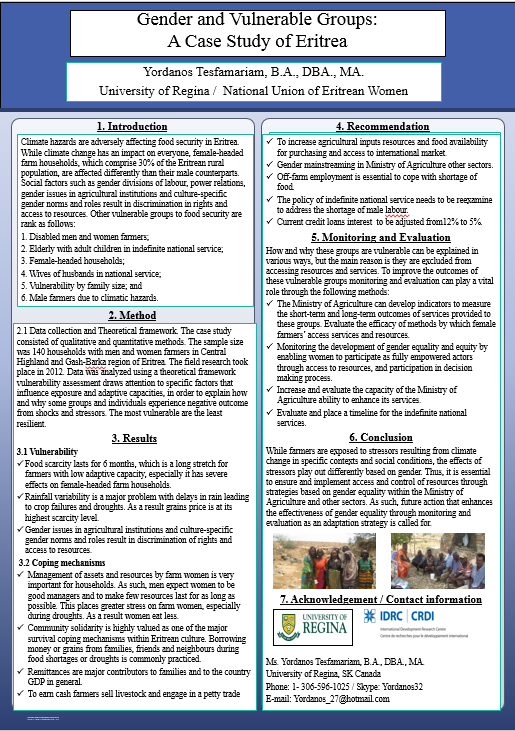 Evaluate the efficacy of methods by which female farmers’ access services and resources. - Monitoring the development of gender equality and equity by enabling women to participate as fully empowered actors through access to resources, and participation in decision making process. - Increase and evaluate the capacity of the Ministry of Agriculture ability to enhance its services. - Evaluate and place a timeline for the indefinite national services. While farmers are exposed to stressors resulting from climate change in specific contexts and social conditions, the effects of stressors play out differently based on gender. Thus, it is essential to ensure and implement access and control of resources through strategies based on gender equality within the Ministry of Agriculture and other sectors. As such, future action that enhances the effectiveness of gender equality through monitoring and evaluation as an adaptation strategy is called for. This poster was designed and produced by Yordanos Tesfamariam.